This post is way way overdue. I bought Niftee's fabulous iPhone cover back a LONG time ago, when I was in Kuwait for a short break. The islamic inspired design is bound to make your iPhone look different from everybody else's, especially if you don't leave in the Middle East, I have received countless compliments on it. The cover is basically a very sturdy stick on.. I though that it would peel off or give me trouble but its been almost four months now and its still going strong, and I am not gentle at all with my phones. 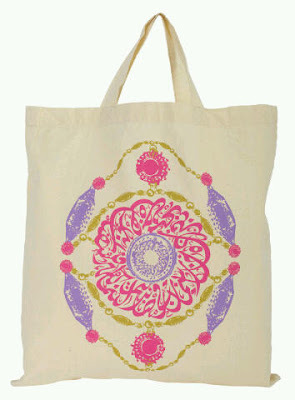 The generous folks at Niftee also sent me a fab canvas bag designed by one of the their interns, which sports exquisite arabesque calligraphy. Thanks, I truly loved it. To get your iPhone cover click here.